The reception starts with friends and colleagues making speeches honoring the bride and groom. A banquet of French, Chinese, or Japanese cuisine might be served. 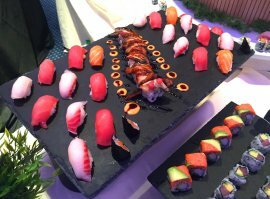 Many Japanese wedding menus, or Japanese-inspired weddings, or, today in America, almost every wedding, includes a colorful sushi presentation. 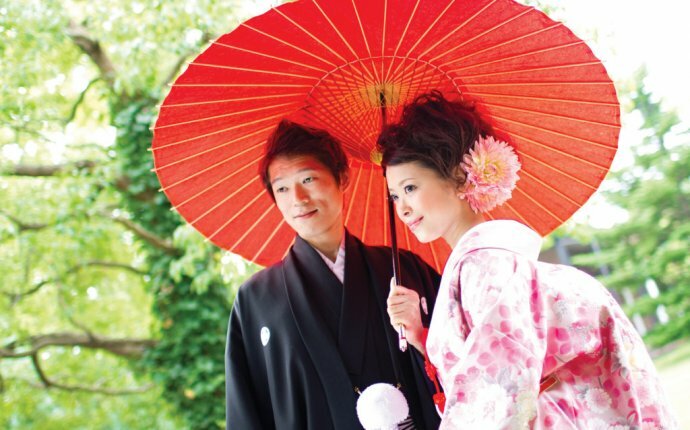 Japanese weddings also often serve foods like sea bream, shrimp, and red rice for good luck. In some cases, they also use gold dust for decoration. During the reception there is a kagami-biraki or “opening the lid” ceremony, where the lid of a sake barrel is broken open with a wooden mallet and the sake is served to everyone. Because of its round shape, the lid is a symbol of harmony. During the reception the married couple sits on a stage and enjoys speeches and performances from the guests. The bride and groom typically give speeches thanking their parents while also giving them small gifts. The reception includes oironaoshi, the bride’s frequent change of outfits, from kimonos to dresses. Some brides change three or four times! Thid tradition of changing clothes several times dates from the 14th century and symbolizes the bride’s readiness to return to everyday life. At a Shinto reception, the bride will get married in a long white kimono. Then she may come to the reception in a colorful, embroidered kimono, then change into a Western-style white wedding dress, and then into an evening gown or a party dress. If she has a Western-style wedding, she might arrive in a wedding dress, then change into a kimono and then into one or more party dresses. - What is the culture of japan? - What does Sakura mean in Japanese?